With all the time and money you put into generating new business leads, surely no marketer would actively do anything to push those leads away, right? Unfortunately, while you may ever intend to lose leads, marketers make little mistakes every day that hold back well-qualified leads from ever becoming valued customers. Whether by creating impersonal content, sending unclear calls to action, or not following up with MQL’s, you may not even be aware of the faux-pas that are turning your would-be customers away. 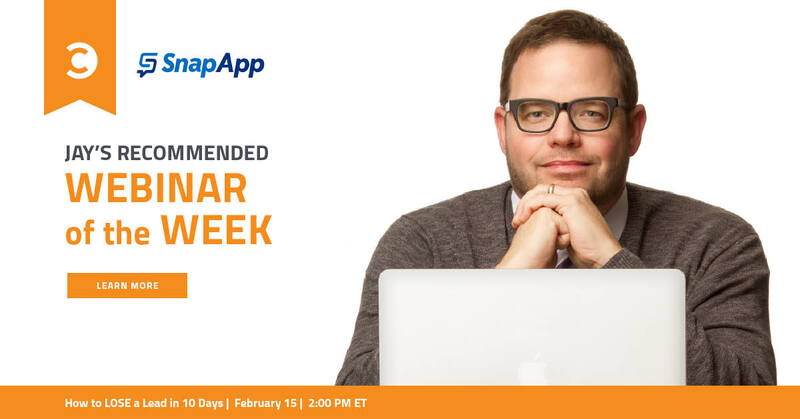 On Wednesday, February 15th, our friends over at SnapApp will be walking through all the things not to do if you want to convert those warm leads into sales. Just as this clever title and movie reference suggests, converting leads into sales really is a lot like dating, or even making a new friend for that matter. Whether it’s with a significant other, a potential customer, or even a friend or business acquaintance, nurturing a new relationship always involves a few similar milestones. You can’t build a relationship with someone you’ve never met. You also can’t do business with a customer that’s never heard of you. We all know the first step in marketing is awareness—as in, your audience needs to know that you exist, and your brand has to make contact with the customer in some way. That first meeting must be memorable, leaving the customer with a lasting impression about your business. Typically we all gravitate toward relationships with others who share something in common with us, or who have similar values or goals. When my wife, Alyson, and I first met, we found ourselves talking for hours about politics (we met in political science class) and New Wave bands (I was a big Cure, Smiths, New Order guy at the time). Having that in common made us both want to spend more time together. What is your target audience interested in? What is most important to them? Creating content that shows you identify with those interests will draw your customer closer. We weren’t a couple for quite a while. Just friends, you know? But I was also looking for ways to spend more time together by adding value. My ace in the hole was that I had a car when we were freshmen, and she did not. The siren song of transportation is powerful, indeed! I vividly remember giving her a ride to the end of semester party at our professor’s home. While we were talking, I discovered that her father was the Executive Director of the organization that was funding my scholarship. That was an… interesting and important revelation, and one that I never would have stumbled upon had I not added value with the chauffeur routine! In the customer journey, this is really where your content has the opportunity to shine. By helping your customer answer a question or solve a problem, you add value to the relationship and keep them coming back for more. Obviously, in order to do business with you, your potential customer needs to know that you know what you’re doing, that you’ll be reliable and honest. That’s why if ever something does go wrong—if you have some kind of customer service crisis or just a bad review on social media—it’s so critical to be honest and forthright in your communications. Even if they’re not directly involved in the situation, future customers are watching how you’ll behave in this moment, and what they see will impact the trust they have in your brand. In a dating relationship, this might be the moment you have the dreaded “talk,” or meet the parents—or even make a marriage proposal! In your marketing courtship it’s the point of sale, when a warm lead becomes a paying customer. If you’ve played your cards right throughout the customer courtship, this next step will come easily and naturally. But as we’ll learn from SnapApp’s webinar, there are plenty of common pitfalls along the way where things might go awry. Register for How to Lose a Lead in 10 Days right now to make sure you’re not flubbing key opportunities to turn leads into sales. By signing up now, you’ll also gain access to other great resources from SnapApp, including a year-round campaign planning guide for each month, an assessment to see if you’re keeping or losing leads, and an additional on-demand webinar that will walk you through the most lovable types of interactive content to nurture relationships between your audience and your brand. You won’t regret it!